Applications for GRADE ONE in the Sinhala and Tamil mediums will be made available for boys who will be FIVE YEARS of age on the 31.01.2018. Application forms could be obtained from the School office on payment of Rs. 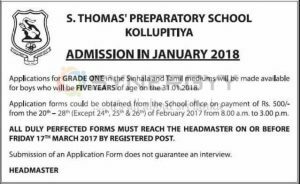 500/-from the 20th – 28th (Except 24th, 25th & 26th) of February 2017 from 8.00 a.m. to 3.00 p.m.
All duly perfected forms must reach the headmaster on or before friday 17th march 2017 by registered post. Submission of an Application Form does not guarantee an interview.